Tyler is a stud colt born 6/2/06 out of Teade 392 and our studbook mare Tekla W, (dam’s sire Erik 351). 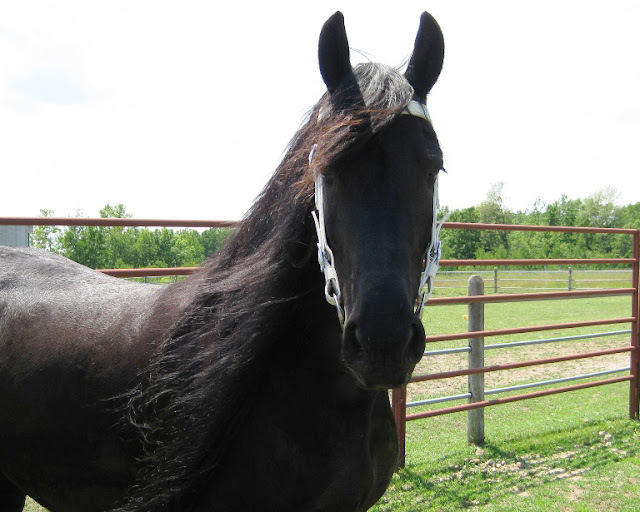 He has the same characteristics in the head as his sire and grand sire (Anton 343, who's known for his hair!) He has long legs and already knows how to use them. His mother's extremely mild disposition inspires him to be calm and gentle. 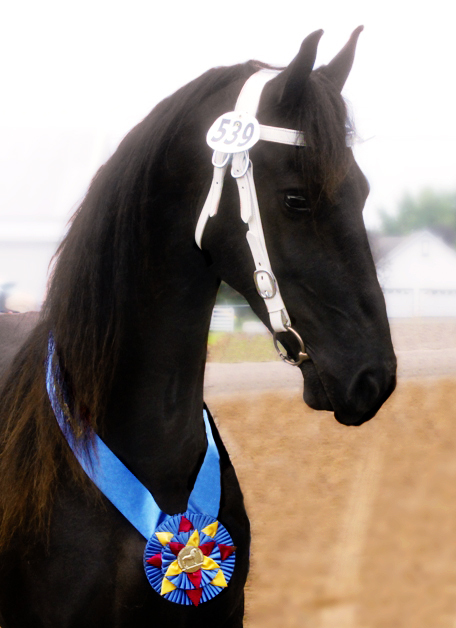 Teade is the most popular Friesian in the country and is competing at 3rd level with scores in the 70's. Tyler would make a great prospect for dressage. Tyler's friendly and loving around adults and kids. He enjoys playing in the pastures with the other horses and dogs. He also likes to watch us drive the machinery around the farm. Tyler has some of the same inquisitive nature and intelligence as Reagan. 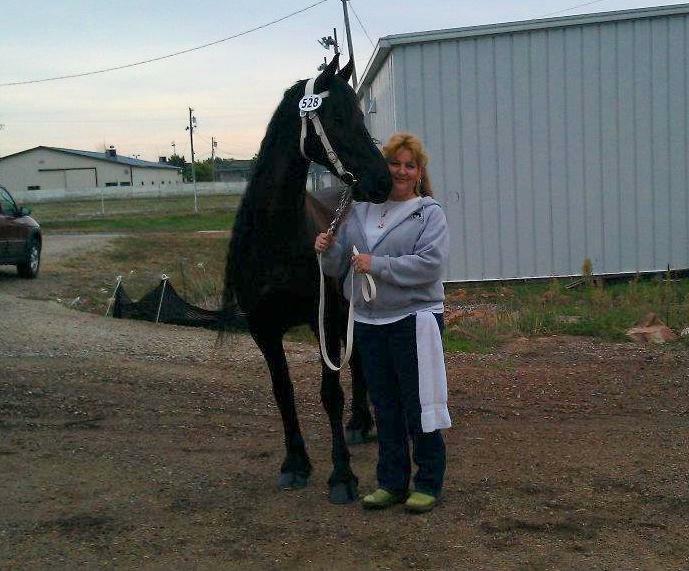 Congratulations to Lizann from Oregon on your purchase of Tyler! Tyler got a 2nd premie at the 2006 Minnesota Keuring! 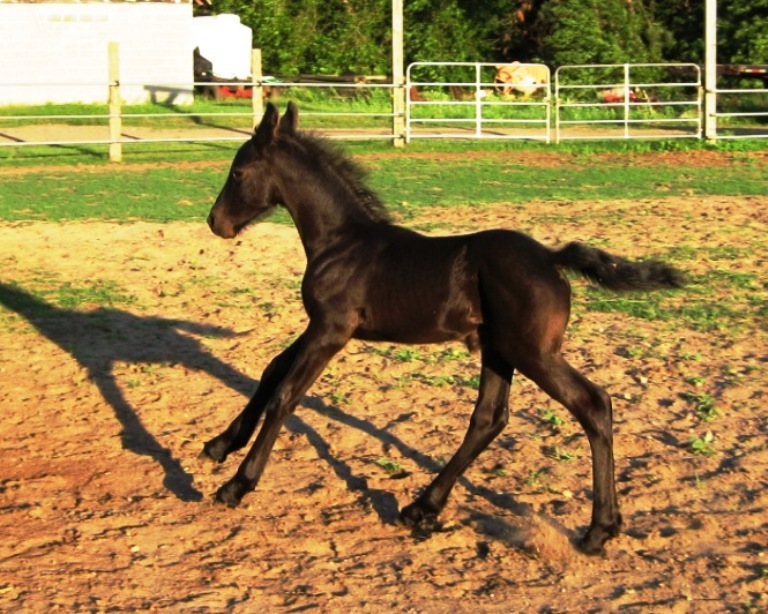 George is a registered FPS/FHANA yearling stud colt, born 7/12/2010 out of Nanning 374 and our studbook mare Tekla W, (dam’s sire Erik 351). He is a big boy, over 100+ pounds when he was born. 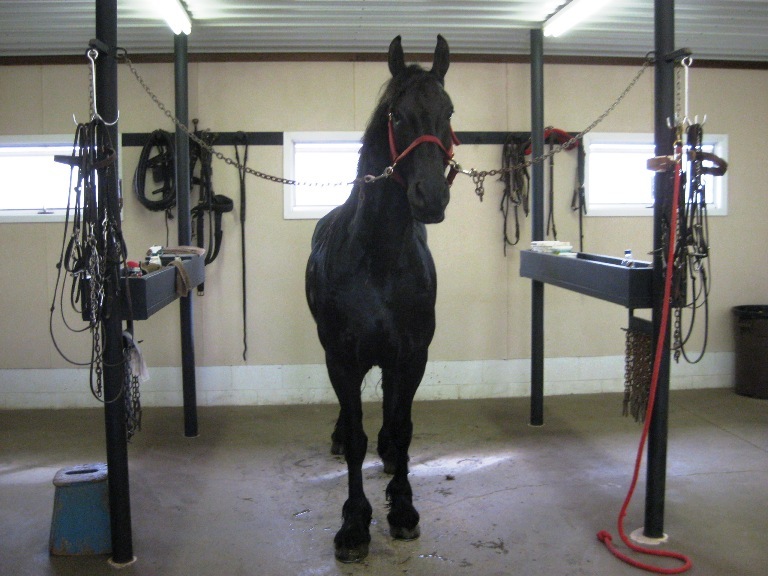 George has noble features inherited from Nanning, including long forelegs, gorgeous arched neck, and a large chest! He will mature to 16+ hands. He is very sweet and loves to follow you around. George received a 2nd Premie at the 2010 FPS/FHANA Dutch Friesian Keuring Inspection at the Central Wisconsin State Fair by the Dutch Friesian judges! Congratulations to Guy of New York on the purchase of George! 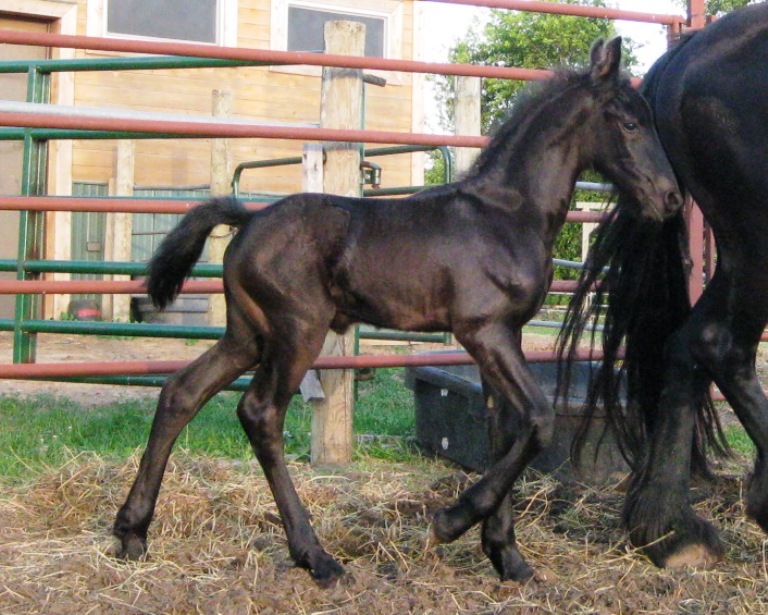 George and his mom, Tekla, at the Friesian Keuring Sept. 2010. - George was awarded 2nd premie! 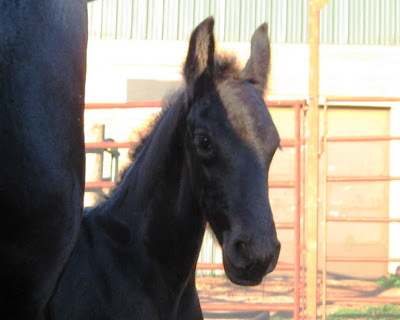 Abigail, "Abby," is an FPS/FHANA filly born 5/9/08 out of Anton 343 and our studbook mare Liefke Von Reh, (dam’s sire Jorrit 363). Abby is very much like her mother. She has feminine characteristics and an outgoing personality. She's the first one to greet you in the morning, when entering the barn! Abby has a sweet face with pretty eyes. 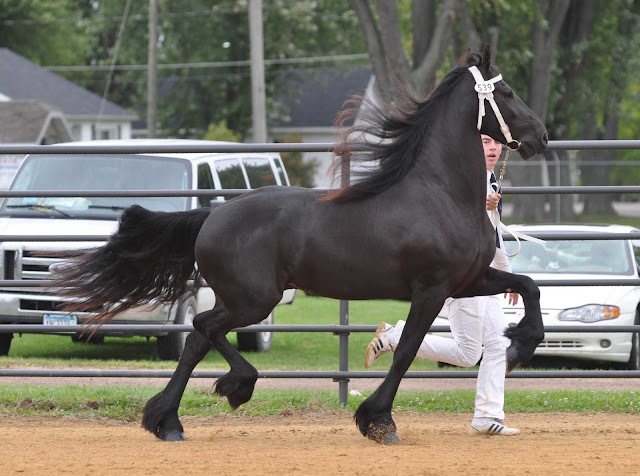 Her movement is graceful and floating, which is a traditional Friesian trait. 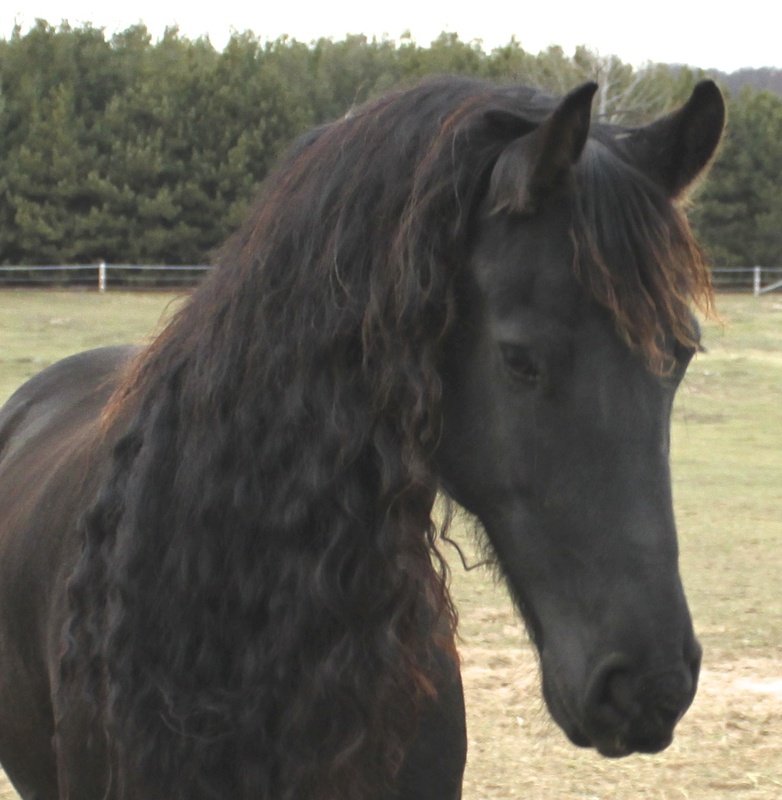 Abby's sire, Anton 343 passes along his classic Friesian look, abundant hair and athleticisms. Anton's offspring are affectionate, levelheaded, and full of personality. 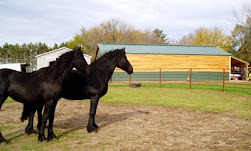 Abby is curious and interested in farm activities - kids, horses, dogs and farm equipment, and doesn't spook. She should mature to 15.3 hands and be of modern build. 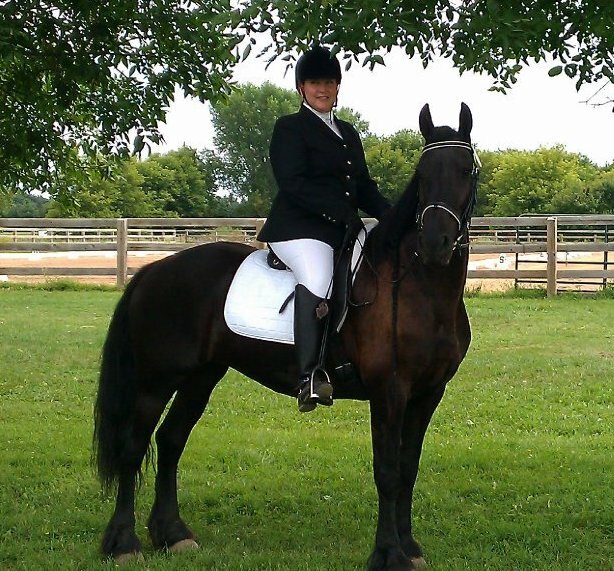 Abby would make an excellent prospect for dressage or pleasure riding. Congratulations to Julie W. of Wisconsin on the purchase of Abby!! Reagan is a registered 3rd premie studbook FPS/FHANA, born 5/23/05 out of Nanning 374 and our studbook mare Tekla W, (dam’s sire Erik 351). He has noble features inherited from Nanning, including long forelegs, gorgeous arched neck, powerful hindquarters and lots of feathers! Over the past two years, Reagan has been trained to ride and drive. He was training for four months this past summer to drive, while preping for the Friesian Keuring. 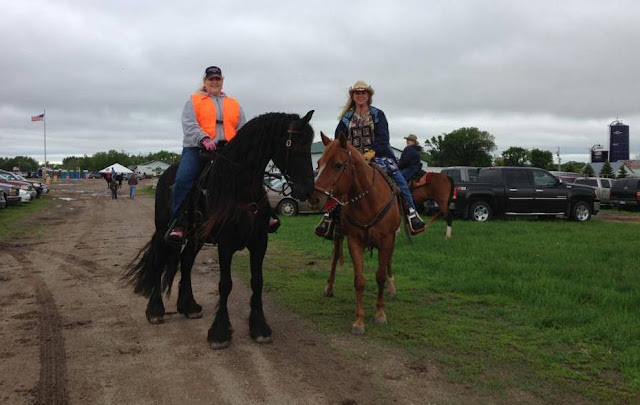 Then he spent two months training on trail rides, including over night horse camping. Reagan really enjoyed good workouts with steep hills, rough terrain and swimming in the river. He is very willing and eager to learn new things. He is great for vets, ferriers, and grooming, including washing & clipping. Reagan enjoys visitors who stop by to see him, and he loves attention from everybody especially children. Reagan will be an excellent horse for all disciplines including dressage, western, pleasure and driving! 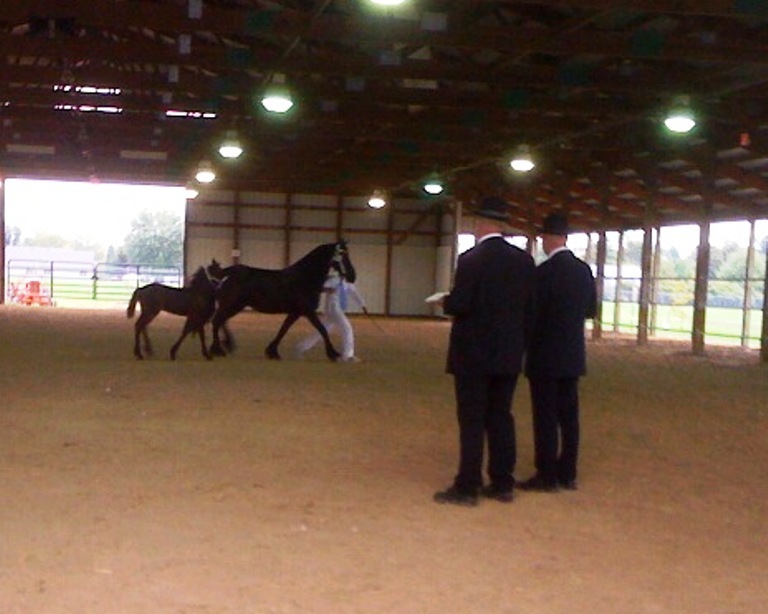 Reagan received Grand Champion Gelding award at the 2010 FPS/FHANA Dutch Friesian Keuring Inspection at the Central Wisconsin State Fair by the Dutch Friesian judges! 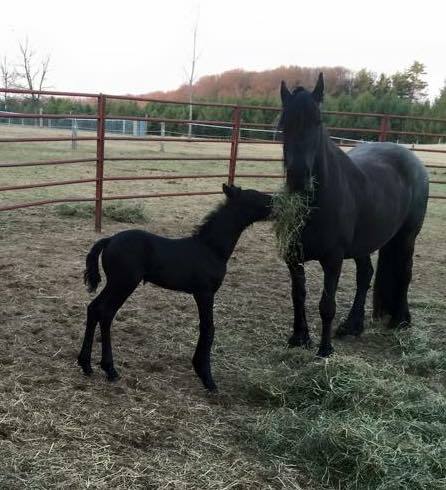 Congratulations to Debbie of New York on the purchase of Reagan!! 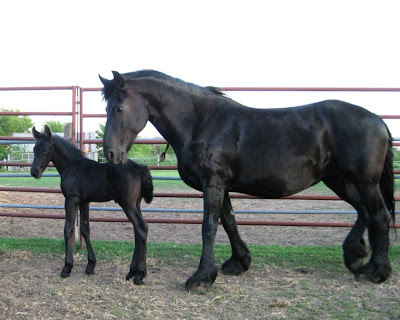 Calvin is a 9 year-old FPS/FHANA Ster, Grand Champion gelding born 5/27/08 out of Anton 343 and our studbook mare Tekla W, (dam’s sire Erik 351). He is a big strong boy, with long legs. Calvin's sire, Anton 343 passes along his classic Friesian look, abundant hair and athleticisms. Anton's offspring are affectionate, levelheaded, and full of personality. His mother's mild disposition inspires him to be calm and gentle. Calvin is inquisitive and fearless around adults, kids, horses and farm machinery. He also enjoys playing in the pastures with the horses. Calvin is 16.1 hands with tons of hair! 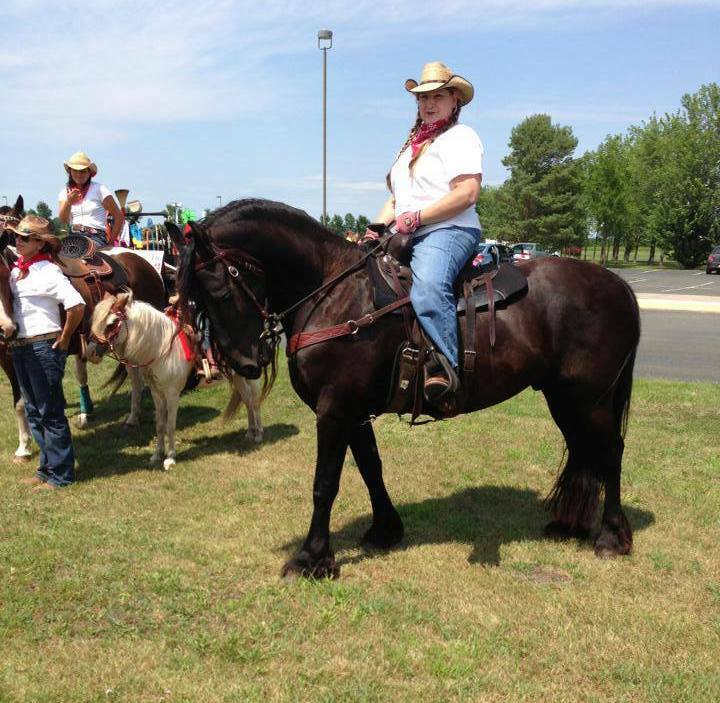 Calvin has been trained in Dressage & Driving.